The battle for search engine ranking is as fierce as it’s ever been. Particularly in the travel industry, where a handful of enormous operators tend to dominate most online travel searches. In fact, many of these operators are themselves becoming the keywords that are searched for. That’s not SEO, it’s just unfair! So what can travel startups do in the face of such challenges? How can they gain traction and move up search engine rankings? Are there any industry-specific trends that travel hopefuls should be looking to jump on board of? 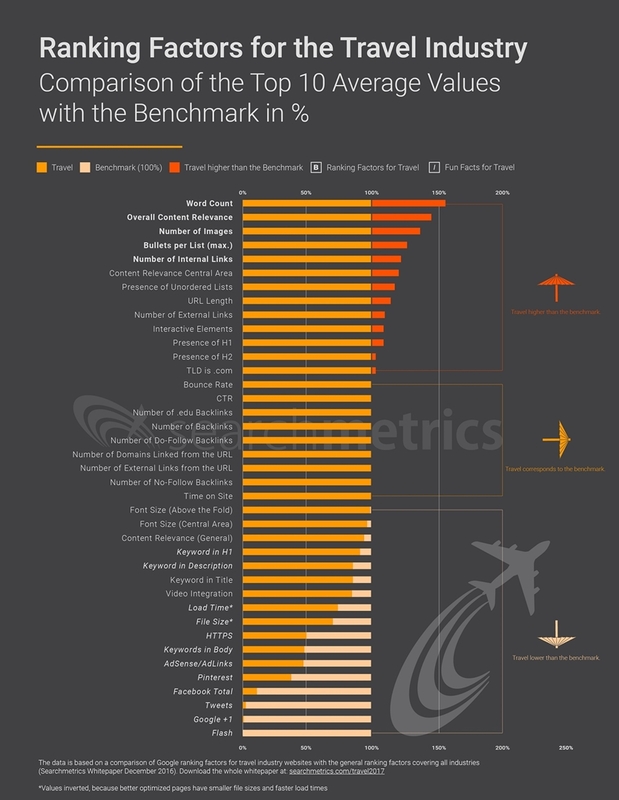 New research from Searchmetrics has brought to light some interesting (and no doubt significant) travel industry-specific search ranking factors. We expect that no matter what field you’re in, whether you’re a travel agent, airline, hotel chain or related brands, improving visibility in Google searches will be a priority. In many ways, this is standard SEO practice. A ‘browsable experience’ is arguably just a fancy way of saying that it’s easy for browsers to move between content, from one page to another. So this will include easy to navigate menus and, we assume, plenty of internal links. There’s be more detail on this below, but this key point encompasses the usefulness of a particular post or page. Customers are searching for a reason, after all. Easy to gather and compare is arguably referring to having a high quantity of content as well as high quality, as well as pointing out that how it’s formatted is significant. For example, there are always plenty of list articles and ‘top X’ pieces towards the top of search engine rankings. High ranking pages cover topics comprehensively, using more words and more large images, even if this means pages load a little slower. This is interesting in one sense, because it suggests that page speed isn’t necessarily as important as it’s made out. Plenty of SEO posts will tell you that too many HQ images will impact upon your page loading speed and lower your ranking in Google search. Apparently not. Covering topics comprehensively, with more words, is again to emphasise the quantity point. People want information, and Google’s best way of gauging how informative an article is is to look at its length. There are obviously other factors, but the number of words will always be significant – they are the table upon which all the other SEO factors are served. Now let’s get into the detail. The press release included a few interesting quotes from the team at Searchmetrics. “Google now more accurately determines searchers’ intentions by analyzing the keywords and phrases they enter in the search box,” said Daniel Furch, Head of Content Marketing at Searchmetrics. So this suggests that Google is increasingly understanding context when you type something in. If you search for two related terms it may well point you in the direction of the missing link you’re looking for. So perhaps keyword stuffing is officially dead. Google will now pick up on synonyms, related phrases and words in the same lexicon? The Searchmetrics team put plenty of time into the latest study. They carried out an analysis of the top 20 search results on Google.com for over 6,000 typical travel-related search terms. So these are terms like ‘airline tickets’, ‘vacation rentals’ and ‘budget rental car’. The team then filtered the results to find the most commonly occurring elements that appear in these travel results. They took a closer look at how they differ from a separate, broader Google ranking factors study, which analyzed the results from 10,000 general, high search volume keywords that apply across all industries. Below are five main points from the analysis. These are the things that travel sites should consider when planning their content and SEO strategy. As you can see from the infographic below, the top 5 ranking factors were word count, the number of internal links, number of images, overall content relevance and the number of bullets per list. Travel-related pages that rank higher tend to be more browsable. Essentially this means that they included more internal links. These allow site visitors to easily navigate between relevant content and is basically the opposite of a high bounce rate. People want to stay once they’ve arrived, which is a great sign for any search engine. 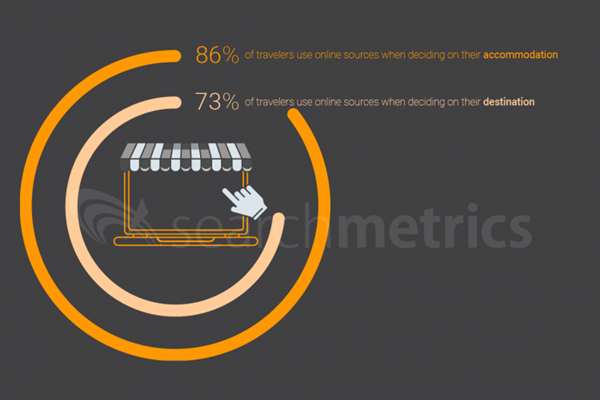 This translates well to the travel industry (and makes a lot of sense) because travel searchers are likely to be keen to compare different views and options, and more generally just gather related information about an operator or destination. So what about the figures? How important are these ranking factors? The study found that travel-related pages ranking in Google’s top 10 results have around 23% more internal links (compared with general results that rank in those positions within its broader ranking factors study). The number of internal links on a travel page and how highly it ranks were also found to show a high positive mathematical correlation of +0.21. Or, the more internal links on the page, the higher it ranks. But let’s not get carried away. Having a high number of links isn’t a silver bullet here. Sure, that helps travel pages to rank well, but the priority is to have an intelligent internal link structure, using the menu, sidebars and content – all in a way that guides visitors intuitively through the website. “Travel-related brands need to ensure their web pages intelligently link to related content throughout their site, so searchers can easily find relevant content and background to help them compare and decide on their travel plans,” said Furch. Intuitive browsing is especially important when you’re a traveller looking for information, bookings or last minute deals. As we mentioned above, page loading times hindered by big images didn’t seem to be a factor. In the world of travel the visuals are all important. That potentially explains why search results in the industry prioritised those with big images over those without. Pages that rank in the top ten Google results for travel-related queries use around 38% more images over 200 pixels per page. Using more larger images can increase the file size and slow down page load times, and Searchmetrics’ analysis indicates that travel-related pages listed in the top ten results have a 40% larger file size and take almost 3 seconds longer to load (travel pages take 10.6 seconds to load on average, while the average across all industries is 7.8 seconds). So the conclusion we get from this is that Google search is getting smarter. It now knows that travel industry searchers are keen to see higher quality images, not just a streamlined site that loads quickly. Here at Travelshift, we’re no strangers to long, wordy posts (sorry). We do it because we like to be comprehensive, but also because we are well aware that long posts tend to rank better on Google searches. Travel-related pages that rank higher tend to carry more text than other high ranking pages. In fact, Searchmetrics’ analysis indicates that travel results that make it into Google’s top ten results average over 2,500 words per page (yikes! ), which is 57% more than in the company’s wider benchmark Google Ranking Factors study (the average across all industries is 1,633 words per page for results that rank in the top 10). This suggests travel marketers should be comfortable using longer copy to go through destinations and topics and in plenty of detail. We don’t need to tell you that 2,500 words is a lot of content. The challenge for travel industry marketers is to produce copy that hits that word target without being repetitive, boring and uninformative. Challenge accepted. As with the need for longer copy and links pointing to related content, this finding suggests travel sites need to prioritise satisfying searchers’ hunger for detailed information. After all, using bullet points makes it easier to assimilate details. everything from hotel descriptions to holiday packages and car-hire terms. Think about where in the travel industry you’ve seen bulleted lists before: hotel descriptions, holiday packages, room services, car-hire t&cs. They’re everywhere. If you can master them and tailor them to your niche, you’ll be on to a winner. For a long time in SEO, the aim of the game was to stuff as many keywords, over and over again, into your content as possible. This largely led to hard-to-read web pages that were nowhere near as informative or entertaining as they should have been. It was also just an easy way for people to cheat the system, and for search engines to return results that were high in keywords but not high in relevancy. Thankfully, as we’ve seen, the system is getting smarter. So what’s the lesson here? Keyword matching is a simplistic, outdated SEO technique and it seems even less effective in travel, where brands need to be focusing on creating relevant, informative, comprehensive content that addresses the searchers’ needs. There are a few other important factors that we’d like to draw attention to. These are headings, external links and URLs. All of these can seem like such an afterthought when creating posts and pages for travel industry websites. Putting in headings can seem like such an afterthought, but wow – who knew! We’re constantly guilty of overlooking the importance of headings especially. But this research shows that it really is the little things that make a big difference to rankings. External links are another example. Used another article or post as inspiration, or have a page you’d like to share with readers? Do it! Another important factor in travel industry ranking appears to be the length of the URL. Not too long, not too short, with no filler words – that should do the trick.